Commonly known as the Christmas Tree Cluster, NGC 2264 is actually the catalog number given to the open star cluster and Cone nebula in the constellation Monoceros. 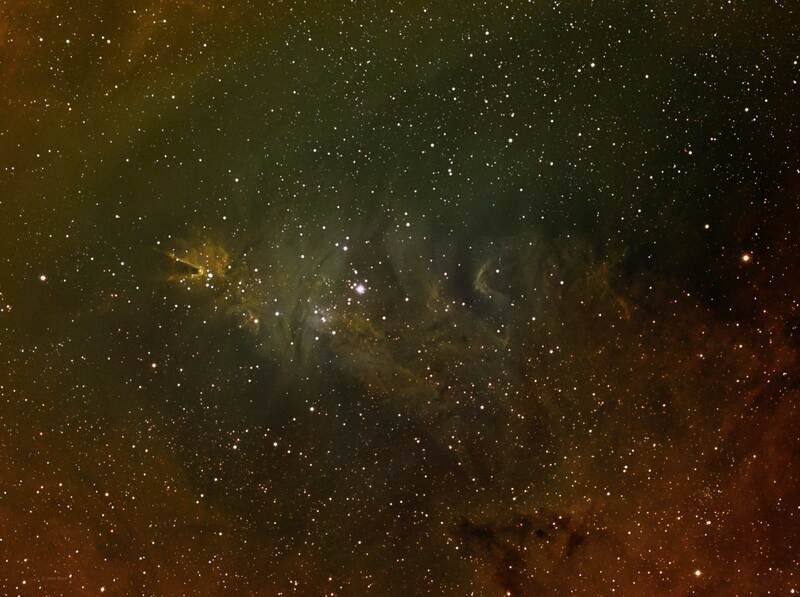 The above image also contains the Fox Fur nebula and Snow Flake cluster. 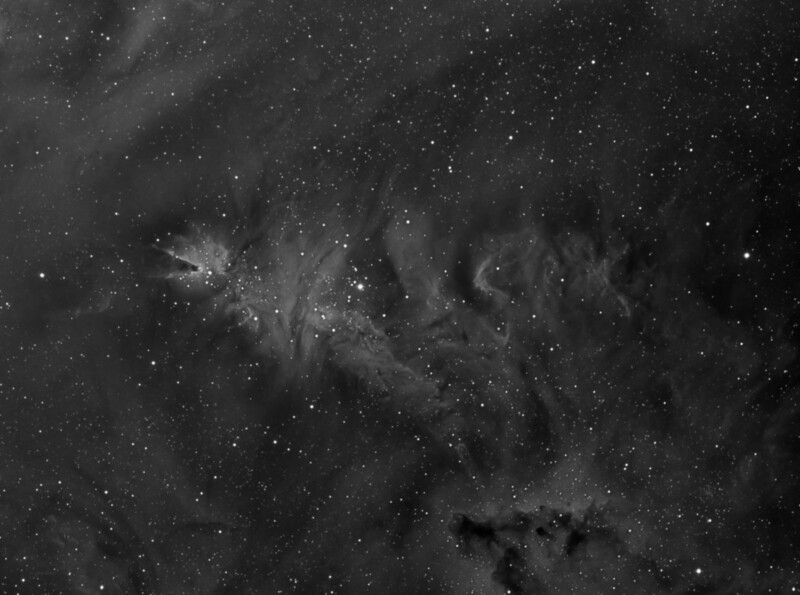 The Cone nebula is the triangular shaped dark nebula in the left center of my image. Behind the Cone nebula is a small emission nebula that provides a contrasting back drop. This area is illuminated by the NGC 2264 open star cluster and also the bright star S Monocerotis. This cluster is blasting away at the Cone Nebula with ultraviolet radiation. There is a beautiful Hubble Space Telescope image that shows this here. The star cluster NGC 2264 is very young at 2-4 million years. It occupies the area between the brighter star S Monocerotis and the Cone nebula. This cluster contains mainly Type O and B stars but other types of stars are present in their pre main sequence phase. Star formation is still occurring in this cluster as evidenced by a high number of pre main sequence stars that pulsate on their way to becoming main sequence stars. Present estimates of stars in the cluster number about 1,000. In my image, the Fox Fur nebula is an emission nebula just below the bright star S Monocerotis. This nebula resembles an above view of a fox with its head looking at S Monocerotis. I want to return to this object next winter with a longer focal length telescope. The above wide field image does not bring out the detail that this fine target contains.